A solar wind stream flowing from ths indicated coronal hole could reach Earth on Sept 16th or 17th. Credit: NOAA GOES-13. The space shuttle is in orbit. We can call you when it's about to fly over your hometown: Spaceweather PHONE. ZUBENELGENUBI & JUPITER: Stick out your little finger and hold it at arm's length. Behold the pinky-tip. That's how far apart Jupiter and Zubenelgenubi are tonight. Tonight the pair are even closer (0.5 degrees). Go outside after sunset and look southwest: sky map. 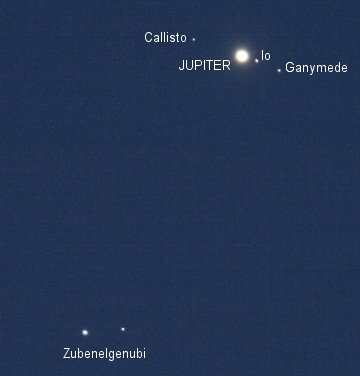 There's Jupiter, the brightest "star" in the sky, and just below it, Zubenelgenubi. You can see them with your naked eye--no telescope required. And if the view doesn't make you smile, try this: Say "zoo-BEN-al-je-NEW-bee." Much better! The seething magnetic froth (that's what plage is) does not signal an impending flare, just "a unique visual and photographic opportunity." 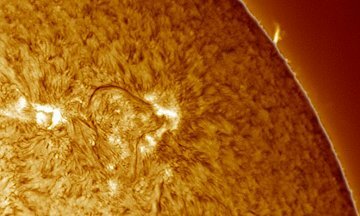 If you have a solar telescope, take a look! more images: from Peter Hoebel of Erlangen, Germany; from Philippe Vercoutter of Ypres, Belgium; from Andreas Murner of Lake Chiemsee, Bavaria, Germany.